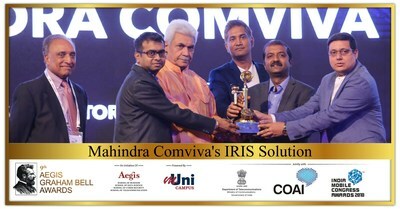 Comviva, the global leader in providing mobility solutions, today announced that it has won the Indian Mobile Congress and Aegis Graham Bell Award under the 'Innovative Telecom solution' category for its MobiLytixâ„¢ IRIS solution. India Mobile Congress 2018 was jointly organised by the Department of Telecommunications (DoT), India and the Cellular Operators Association of India (COAI) for the second time in India. The winners were felicitated by Shri Manoj Sinha, Hon'ble Minister of State (Independent Charge) for Communications and Minister of State for Railways, Govt. of India on Friday, 26th October at a glittering award ceremony in New Delhi. MobiLytixâ„¢ IRIS drives revenue growth and profitability by creating alignment between a communication service provider's retailers and customers when selling prepaid top-ups and service bundles. IRIS leverages deep customer and channel insights coupled with real-time execution capabilities to create a win-win opportunity. Customers receive personalised offers tailored for their needs and retailers are rewarded with incremental commission / points for every successful sale. Speaking on the occasion, Manoranjan 'Mao' Mohapatra, Chief Executive Officer at Comviva, said, "We're delighted that Comviva has won this award against stiff competition from other participants. This win reaffirms our strong leadership position in the industry when it comes to driving innovations. It also validates our ability to cater to localized market needs and requirements with robust solutions. We will continue to invest in such technologies and deliver solutions for different market requirements." Speaking on the occasion, Amit Sanyal, VP & Executive Head - Consumer Value Solutions at Comviva said, "We are happy to win this award which is recognition of the ability of MobiLytixTM to adapt and usher innovations according to new trends and requirements in the marketplace. In today's digital world, organizations have huge reservoirs of data that can be leveraged for providing highly contextual and personalized customer communications. We are extremely excited about the opportunities and further enhancing our MobiLytixâ„¢ platform with new machine learning and AI capabilities that shall help drive higher level of customer engagement and incremental revenue."